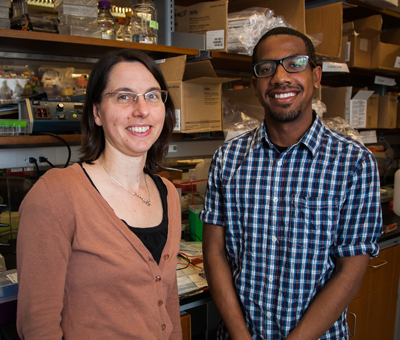 Kenneth Skinner, a second year graduate student in Rachelle Gaudet’s lab, has recently received fellowships from the National Science Foundation, the Ford Foundation, and the National Consortium for Graduate Degrees for Minorities in Engineering and Science (GEM). In September 2013, Skinner will begin a three-year NSF Graduate Research Fellowship (GRFP), which recognizes and supports outstanding graduate students in NSF-supported science, technology, engineering, and mathematics disciplines who are pursuing research-based Master’s and doctoral degrees at accredited United States institutions. As the oldest graduate fellowship of its kind, the GRFP has a long history of selecting recipients who achieve high levels of success in their future academic and professional careers. For the 2011-2013 academic years, Skinner has used a GEM PhD Science Fellowship and a Ford Foundation Predoctoral Fellowship. The five-year GEM PhD Science Fellowship aims to increase the number of minority students who pursue doctoral degrees in the natural science disciplines. It also links graduate students with employers, requiring PhD candidates to do a summer internship with a sponsoring employer. Skinner spent last summer researching at Oak Ridge National Laboratory. Skinner is interested in the sensory system that allows animals to feel pain, with the long-term goal of promoting the development of novel treatments for pain. “This is becoming increasingly important since United States pharmaceutical expenditures related to back and neck pain increased by 188% between 1997 and 2005,” he said. Capsaicin, the active component of chili peppers, selectively binds to transient receptor potential vanilloid (TRPV1), a non-selective ion channel that resides on the membranes of pain and heat sensing neurons and responds to noxious stimuli. However, because very little is known about capsaicin-binding residues of TRPV1, no clinically approved therapeutic TRPV1 antagonist exists, and activation of TRPV1 remains controversial. Skinner is developing a novel photo-affinity labeling approach using diazirine as a biochemical strategy for deciphering how vanilloids bind and activate TRPV1. He hopes that gaining a detailed understanding of TRPV1 activation by vanilloid compounds from a mechanistic and structural standpoint will advance the development of novel TRPV1 antagonists for pain treatment. The NSF Graduate Research Fellowship Program (GRFP) provides an annual stipend of $30,000, along with a $10,500 cost of education allowance for tuition and fees, opportunities for international research and professional development, and the freedom to conduct his own research at any accredited U.S. institution of graduate education. The Ford Foundation Fellowship Program provides an annual stipend of $20,000 and a $2,000 award to the institution in lieu of tuition and fees. It also expenses to attend at least one Conference of Ford Fellows and a liason network with previous Ford Fellows. The fellowship awards are offered at the predoctoral, dissertation and postdoctoral levels. The GEM Fellowship program of the National Consortium for Graduate Degrees for Minorities provides a $16,000 stipend for the first academic year, and additional stipend (assistantships, grants, other stipend dollars) support from the GEM Member University to bring the stipend amount up to the funding level of other funded PhD students in that department. The fellowship covers full tuition and fees up to the fifth year of the PhD program.